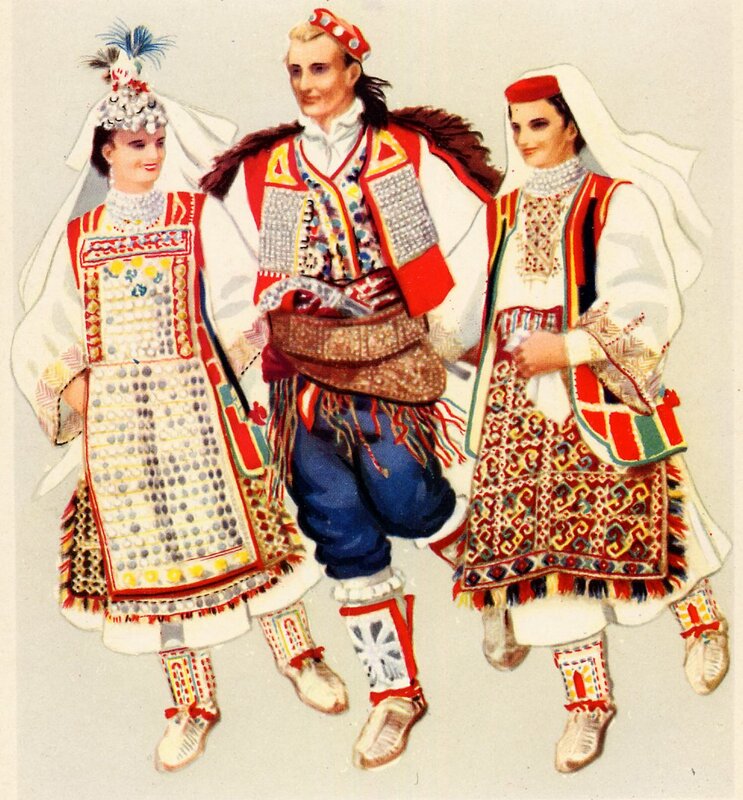 Today i will be talking about the costumes of the Dinaric Region, and specifically about the town of Vrlika. The Dinaric zone covers most of the Dinaric Mountain Range, and includes inland Dalmatia, Western Bosnia, most of Hercegovina, and Montenegro. Physically the mountains continue into Kosovo and Macedonia, but these are not generally included in the Dinaric Ethnographic zone, being inhabited by other nationalities.. Here is a topographical map of the area. There is basically one costume type worn in this area, with only minor modifications. The most distinctive are the Montenegrin and the Dubrovnik-Konavle-Čilipi costumes. Each of these will be featured in future postings. 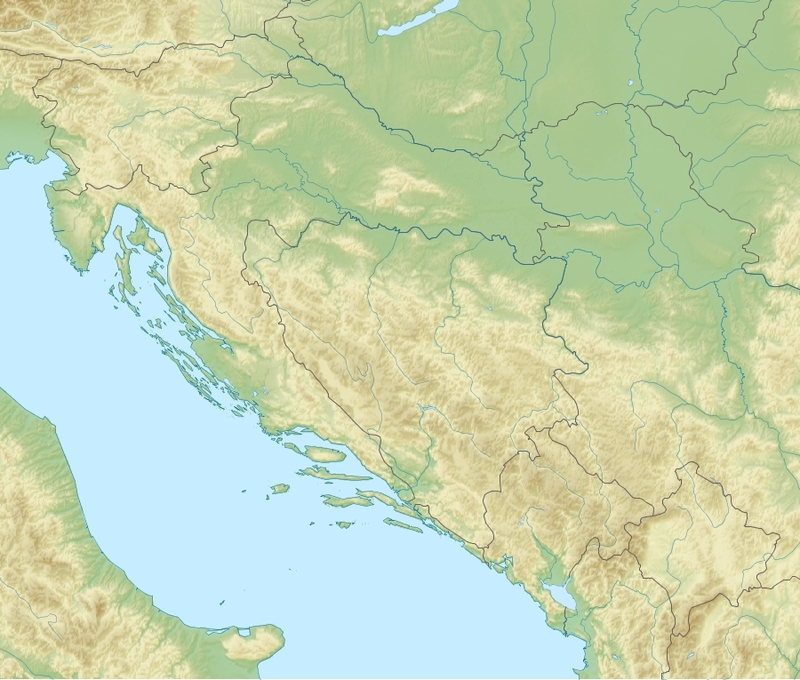 Vrlika is a small city in the middle of the Croatian Dinaric mountains, in the province of Dalmatia. You can find the location on this map. 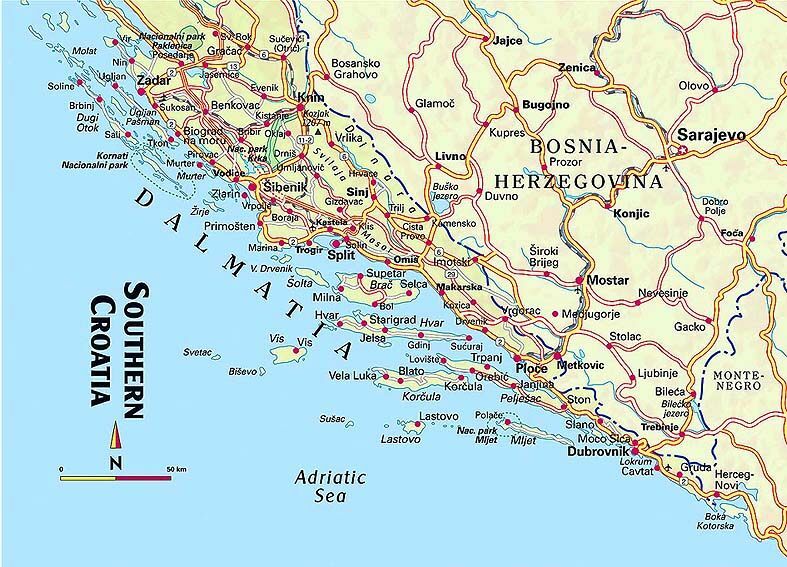 It is aproximately halfway between Knin and Sinj, directly north of the famous coastal city of Split. Vrlika is known for having kept its costume and traditions for longer than some other areas in these mountains. Here are a couple of images to acquaint you with this costume in general. 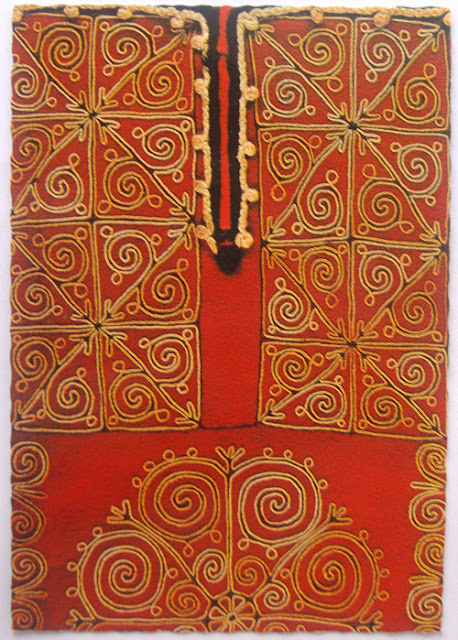 This costume falls into the northern variant of the Dinaric costume. 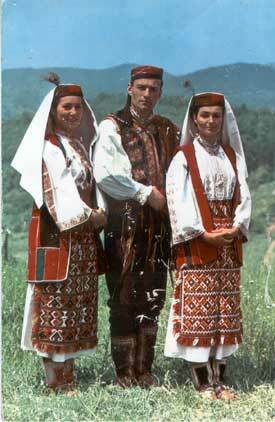 The basic garment, as in so much of Eastern Europe, is the chemise, here called Košulja. 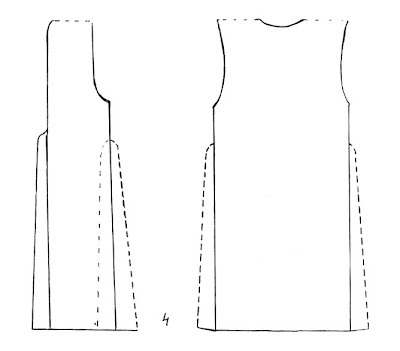 There is a narrow band collar, and full sleeves with no cuff, which are gathered into the top of the shoulder seam. 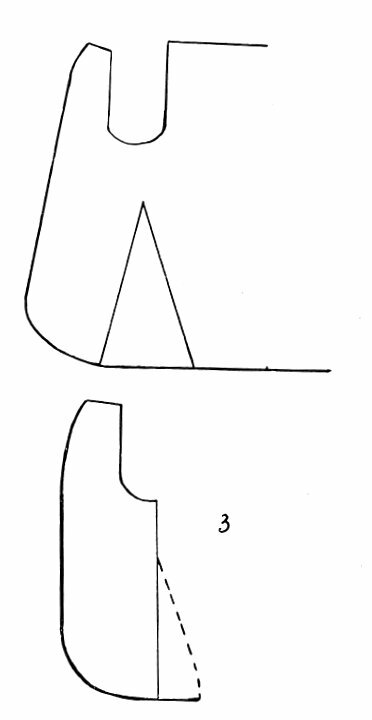 Here is a schematic drawing of the women's garments of this region and the cut of this garment. There is distinctive embroidery on the band collar, in wide bands on either side of the front opening, on the end of the sleeves, and in a band along the outside of the sleeves. There is no embroidery on the hem of the chemise. 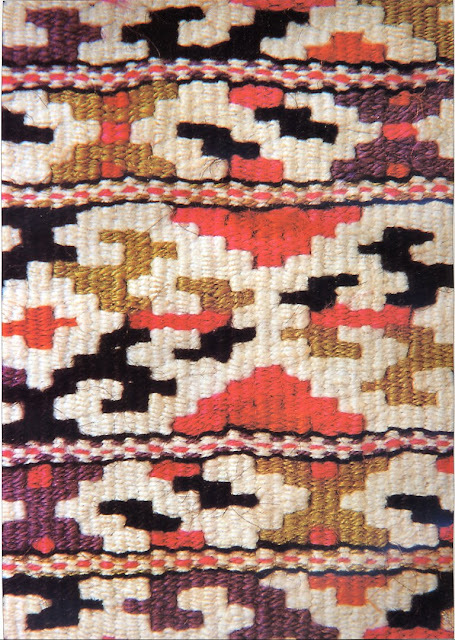 Gererally, the embroidery is either darning stitch, counted flat stitch, or cross stitch. The apron is one rectangular panel, and is very heavy, being tapestry woven in geometric designs with fringe around the bottom three edges. 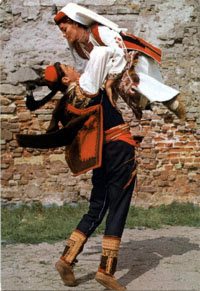 This is typical for the north Dinaric costume. In the southern variant, the apron is narrower, and is lighter, being woven on a loom. 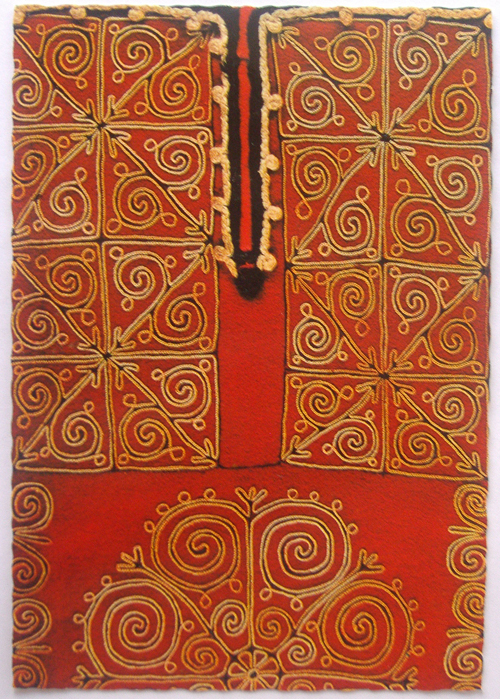 Here is a closeup of the design of one apron. It is typical in this region for women to wear two sashes, the first one relatively narrow and card-woven, which serves to hold the garments together, and the outer one, which is woven on a loom is for presentation, and to be held when one is dancing. See the various images in this article. There is an open vest worn over this, short in the northern variant and longer in the southern. 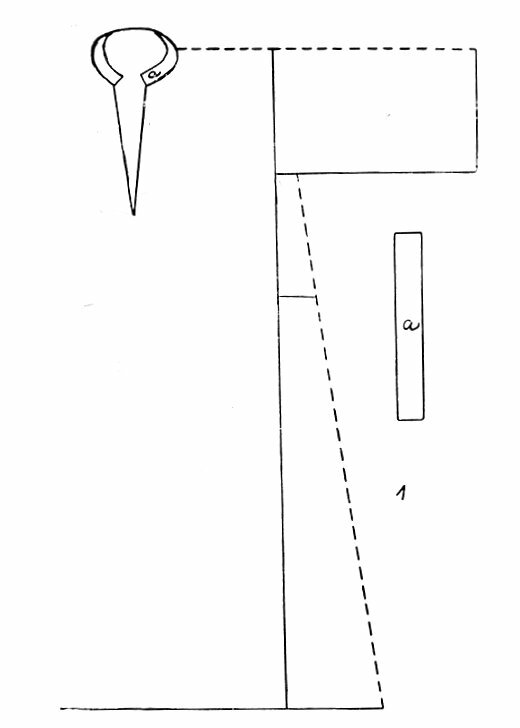 In Vrlika it typically falls somewhere past the hips. It is often called Zubun, but in Vrlika is more commonly called Sadak. It is made of heavy wool in either white or black, and has a gusset inserted at the sides to make it flare somewhat, especially in the long variant. 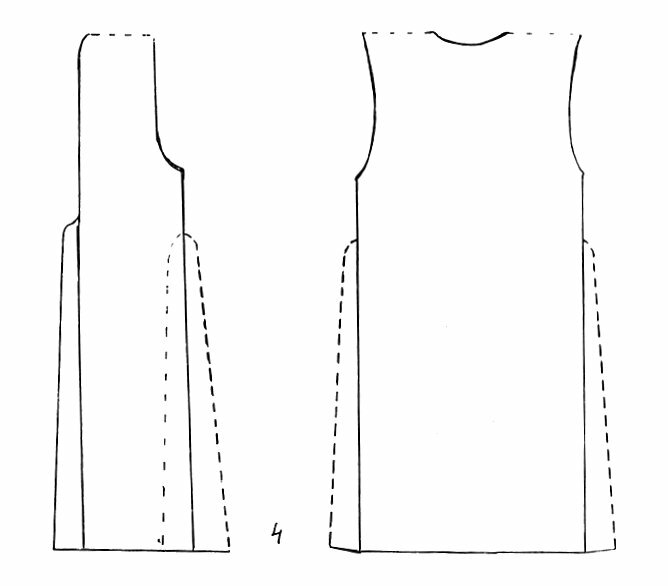 Here are two generic cuts for this garment, long and short. 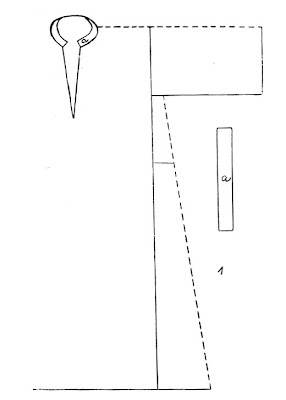 See also the drawing above, on the right. 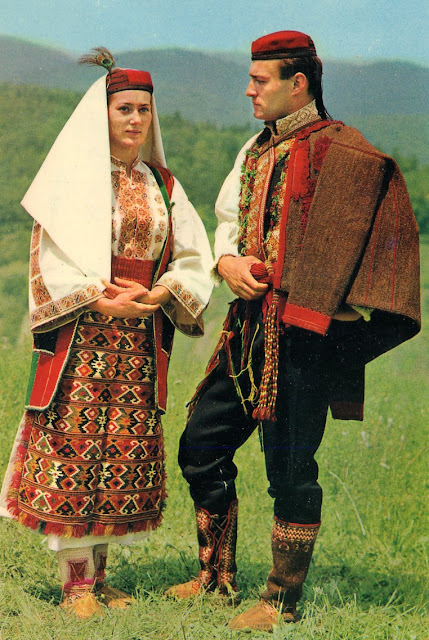 The length of this garment varies somewhat in Vrlika, older and married women tending to wear them longer. The Sadak is very heavily ornamented, in patterns distinctive to each community. 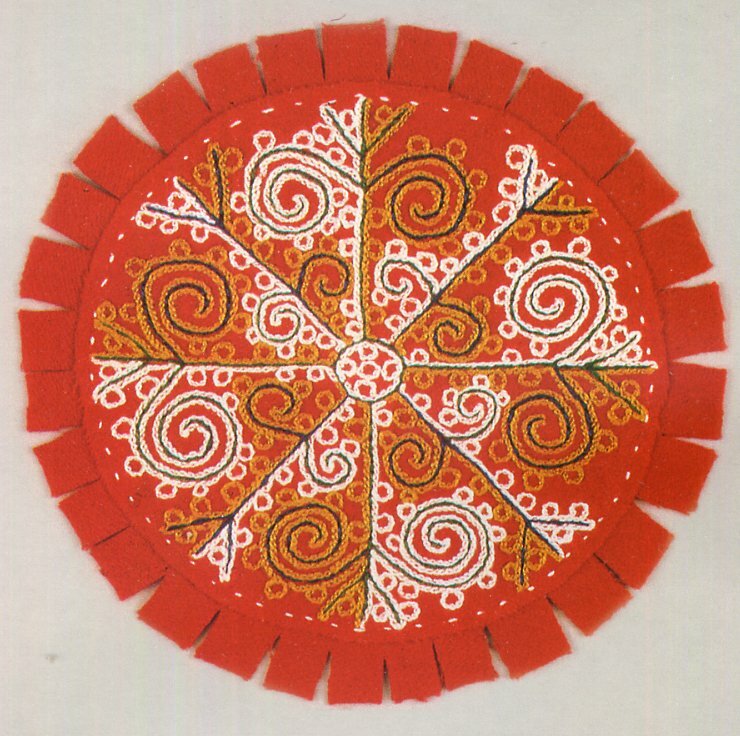 In Vrlika, there are broad bands of appliqued red wool around the edges, this is very typical. [In the very few Muslim communities which wear this costume, the red is replaced by green]. Here are a couple of back views of the Sadak. 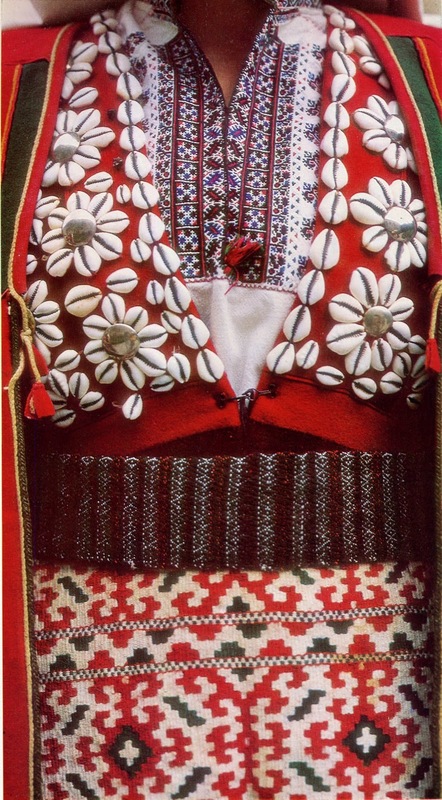 Besides the applequed panels of red and other coloered wool, there are circular appliques behind the arms, which are called Zvrk, and bands on the lower hem, which are either embroidered in chain stitch, or have braid applique in similar very distinctive designs. This type of design is typical of this entire region. In the drawing of the various garments above, there is also pictured a long sleeved, open fronted dress. 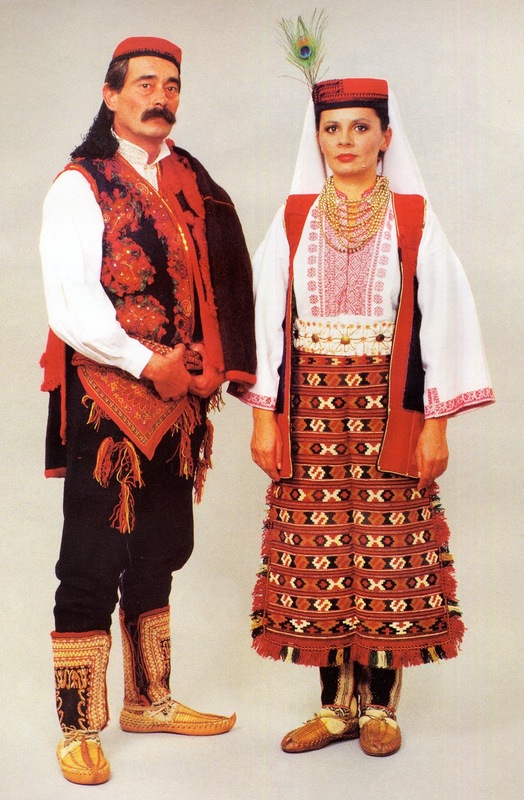 This is common to the entire Dinaric region, and is only worn in colder weather. It is made of heavy wool, and is worn directly over the chemise, under the sash, apron and sadak or zubun. The front is hooked closed. The lower part is typically gathered into the bodice, and the sleeves, cuffs and bottom hem have appliqued panels, sometimes with the same embroidery and/or braid applique as on the vest, and sometimes with cowrie shells and silver buttons sewn on to the front. 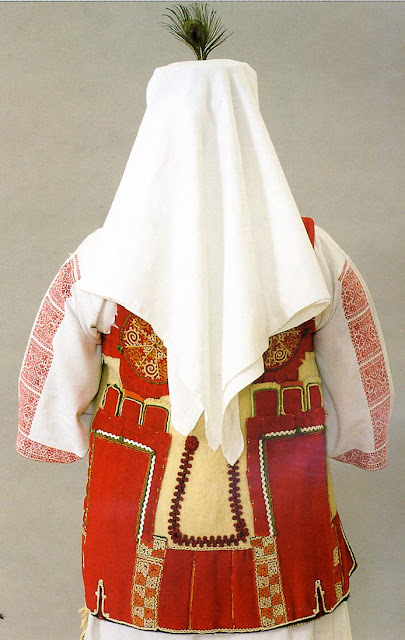 In some parts of the Dinaric region, as in Lika, this has become a permanant part of the costume, worn at all times. Here are a couple of photos of a married woman wearing this garment. 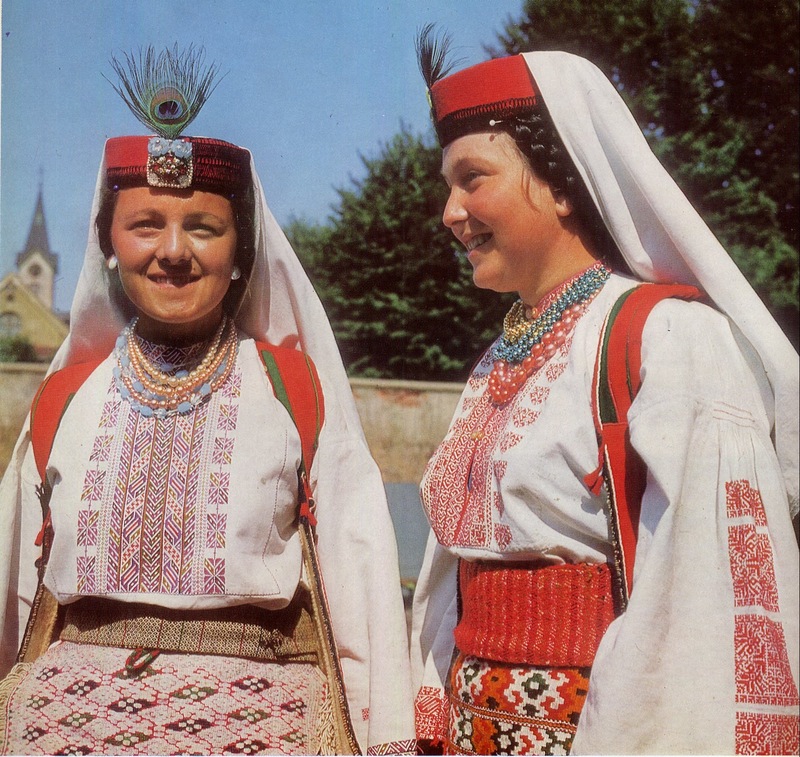 The distinctive headgear for both men and unmarried girls in the dinaric region is the red cap, crvenkapa. Originally the top was slightly cone shaped, but now it is usually flat. The girl's version has a silver brooch, or more than one, holding the end of a peacock feather. There may be other smaller brooches or silver coins attached as well. A white kerchief is folded into a triangle and pinned to the top. 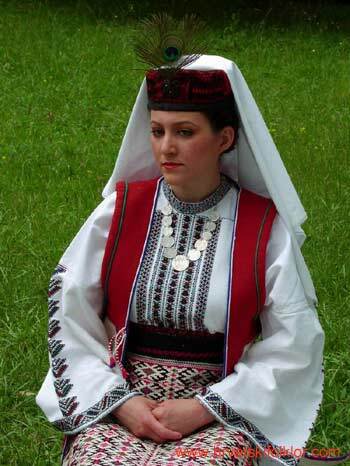 Married women braided their hair into a wooden frame, as in Prigorje, and the kerchief was pinned directly to the braids, as you can see in the photo above. 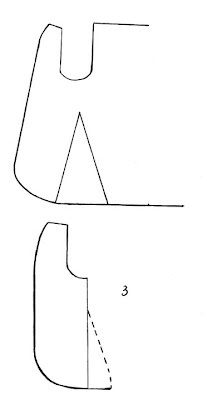 Here is a drawing of the old style cap, followed by a photo of a woman in the new style cap, followed by another photo of a woman in the traditional marred headgear. 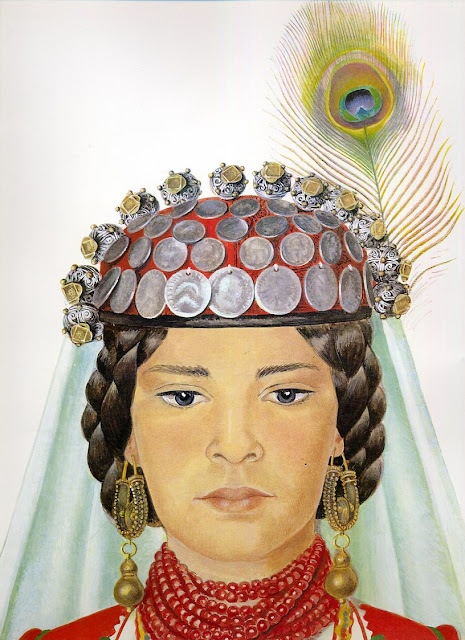 Elaborate filligree or granulated earrings and other jewelry are common in the Dinaric region, but rare in Vrlika. Necklaces of glass beads, coral or silver coins are common.The silver coins, of course, are part of her dowry. 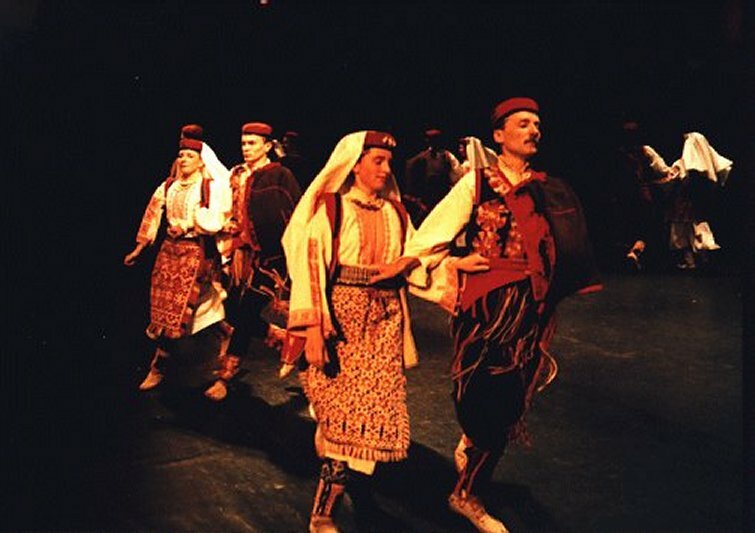 There is a unique garment sometimes worn in Vrlika which is perhaps the result of inflation. This is indicated by its name, Djerdan, which simply means necklace. It consists of a length of linen which covers the front of the body, and which is covered with silver coins. A kerchief is often attached to this at the strap which goes around the neck. Men wear a similar kerchief around their waists. Originally they were hand embroidered, but today mass produced printed kerchiefs are worn. A marriageable girl would wear the Djerdan on special occasions to show off her family's wealth. 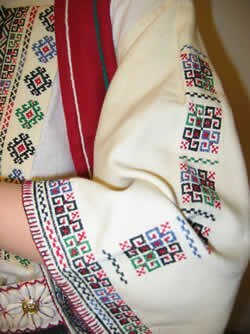 Here is a photo showing a girl wearing her Djerdan. Multiple socks are worn in this region, which is logical, since it is mountainous, cold and rocky. You can see in the above photo that she has long knitted stockings with a geometric design knitted in, which complements her apron. Over the lower shin she is wearing a short type of gaiter, which is embroidered and embellished. 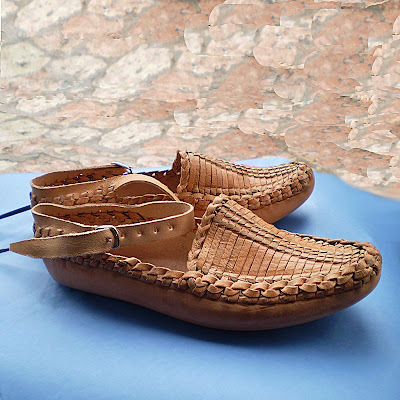 It is sewn of heavy woven wool and laces up the back of the leg. 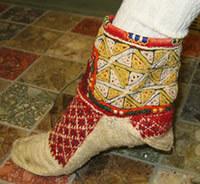 Covering just the foot and ankle is a second sock, which has either knitted in or chain stitch embroidery designs.In this case, this small sock has red wool tabs decorating the top. Here is a photo showing just this outer small sock. Over all of these socks are worn moccasin-type footwear called Opanci. They have the woven top typical of Serbian Opanci, but have either a very small toe or none at all. Thank you for reading, I hope that you found this article interesting. 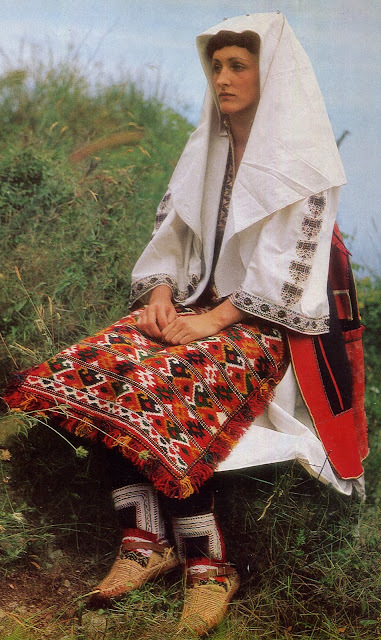 I am continually amazed at the innate taste and love of beauty which characterizes most folk costume. 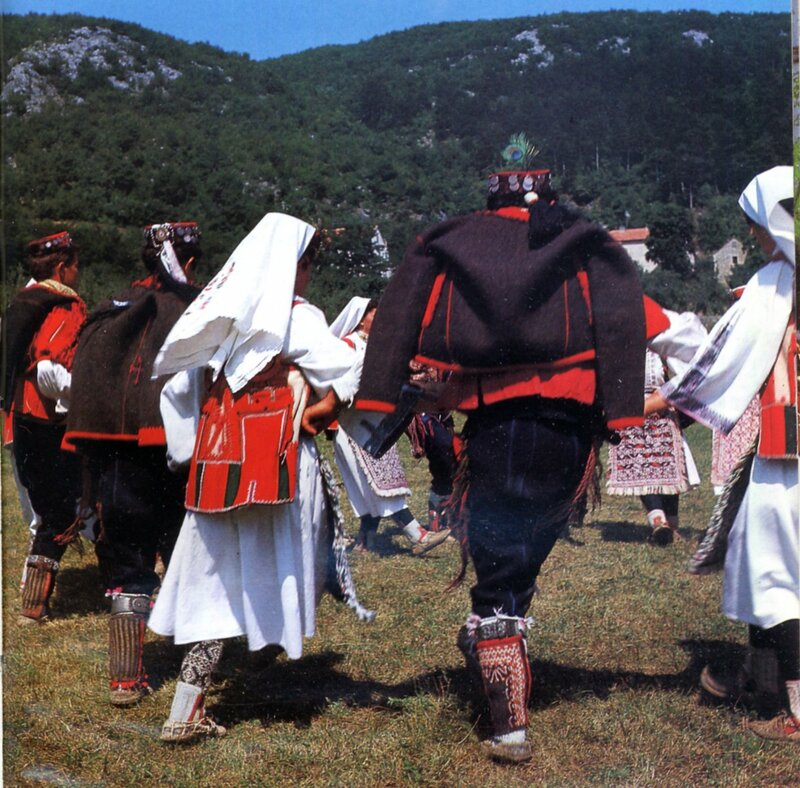 Here is one last image of a group of Vrlicani doing the local dance. I am a Serb. My parents are from this area and I have pictures of my mother and relatives in such costumes. I too have worn traditional Serbian costumes and opanci. The costumes are beautiful and very distinct for the area. The red and white theme reminds me of Swedish traditional costumes. The costumes and the proud beautiful people sums up the very spirit and soul of our people. Thank you for the lovey pictures. They make my heart smile.